October 16, 2011 marked, for the first time, the first of four days for the New York Comic Con. For those that are not regular attendees of NYCC, NY Comic Con has always been a 3 day weekend event. Now included was a Thursday preview night, where you would just get early access to a majority of the convention. You had to buy a 4 day pass to attend this night, but the benefit of it was the smaller crowd size, seeing some of the booths that were already set up such as the Avenger’s booth which was quite a site. It was basically the calm before the storm, and as Friday and Saturday rolled through it was indeed a storm. Adding the extra day will always bring up the biggest issue which will always be space and for everyone that attended, especially on Saturday, it was insane. Preview night was a spa day compared to the other 3 days. Once the announcement was made that a 4th day was added, the media blitz was just as insane as the crowd as we got closer to the date. Coverage of fans standing on line on Thursday morning, while things were being set up was just all over the place. For me having that preview night was good because I wouldn’t have to worry about checking out certain booths on the days that were going to be overly crowded. Unless it was a game demo, like Mass Effect 3 or Final Fantasy 13-2, I was able to go around the con take the photos and conduct the interviews I wanted or needed without too much interference or crowd noise. My first interview was with Turtle Beach, a company that has created some of the most amazing headsets for gaming. Regardless of what system you have, Turtle Beach had a headset for you that made your gaming experience that much better. I went to talk to them about their exclusive Modern Warfare 3 headsets, that were wireless, Bluetooth enabled, and came with some of the most outstand presets for a headset and worked in sync with the game. On hand as my cosplay correspondent was my brother and cosplayer Nelson D. Martinez aka Nox Cosplay, cosplaying X-Force Deadpool. A decision that I wish I had thought twice about, especially since he is just as insane as the character. The booths on display for this year’s NYCC were a lot grander this time around. The Avengers stage was the set from S.H.I.E.L.D, Hasbro had a huge Optimus Prime statue and of course a wide selection of displays. The Cartoon Network lounge was overshadowed by their giant Jake and Fin balloon, and some booths had a life size action figure box where you could be your own action figure. Worked especially well if you were a cosplayers. A big plus about preview night was feet didn’t hurt as much and I really didn’t get hungry. So money and health were still in great condition. On a side note, for the first time ever, I actually got sick day one of the con, instead of the normal aftermath which occurs after the con. I did run into cosplayers Ridd1e and Marie-Claude Bourbonnais out of cosplay doing a walk around as well. While the cosplay crowd wasn’t that big on Thursday, you still saw some great cosplays here and there plus some that you would not have expected such as Larry Smith’s Ruby Rod from the Fifth Element movie. To end the night NY Comic Con brought in DJ Z-Trip to rock the house for all VIP and 4 day ticket holders, well as many as they could fit. Friday things really kicked off and the line that wrapped around the convention was a sign of just how crazy things were going to be. Friday was also my mother’s first time at a convention and that line alone overwhelmed her. To start the day you had the Final Fantasy XIII-2 panel showing the art direction of the game and universe of Final Fantasy. With a game like Final Fantasy you already know that the art will be quite impressive. Aniplex of America held a panel presenting what would be coming soon in Anime to America. Aniplex’s President, Koichiro Natsume, and Executive Producer of Blue Exorcist, Hideo Katsumata, were on hand to give fans a special greeting and a thank you for all the support the fans have given them. Funimation’s Marketing Manager, Adam, Sheenhan, held a panel to discuss and take questions from fans about what is going on with Funimation in the future. Viz Media welcomed fans and Naruto Japanese voice actor Junko Takuechi. Cosplaying or wearing any Naruto gear netted you some very cool swag. 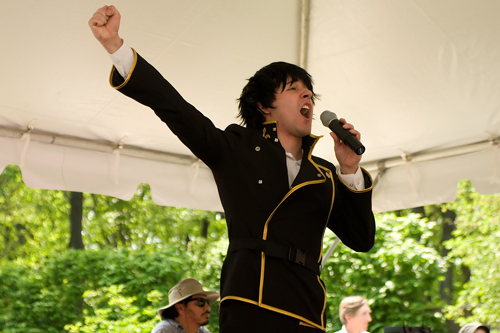 Comedian Uncle Yo performed Road Trippin, a love note to the world of Anime. To talk to Uncle Yo about Anime and cosplay is to talk to someone who is as passionate about it as one can be if not more. He looks at it from where it was all those years ago when Anime wasn’t as accessible, to now where anyone with a computer or cell phone can watch this incredible genre of animation and storytelling. Walking around was not as easy as Thursday but still manageable. Taking my mom was like a good luck charm, because by accident we ran into Nerdist’s Chris Hardwick and Linda Le aka Vampy. Chris Hardwick is no stranger to the NY Comic Con, having met him at 2009 NY Comic Con at a panel he was hosting. As friendly and cool as I remembered, I got a picture of him with my brother. Luckily we ran into earlier in the day because he was gone for most of the day, or no one could find him as easily as we did. Vampy was very cool to meet, as sweet as she is online and short, but cute short. This was her first NY Comic Con and she cosplayed as Psylocke from the X-Men this day. She attended the con Saturday as well and of course I missed her completely. The ultimate nerdist, Felicia Day was around all weekend signing autographs in the autograph section of the con as well as doing a spotlight panel on her career and what’s to come. She was also on hand for the Dragon Age Panel, talking about her role in the live action series based on the game. One of the biggest names of the con; the man who brought balance to the force and brings a smile to your face with as much force as possible Mark Hamill made a big appearance the entire weekend of the con. For cosplayers, today was the first of three days of the costume contest over at the Hasbro booth. So for people who had a cosplay for each day of the con this was the opportunity to show that those late and sleepless nights were all worth it. For gamers all weekend long hands on demos of upcoming games included Ultimate Marvel vs. Capcom 3, Final Fantasy XIII-2, Mass Effect 3, Marvel Super Hero Squad, and Street Fighter x Tekken. For TV viewers, FOX presented their exclusive screening of the live action adaptation of IDW’s comic Locke & Key. Locke and Key is a great horror comic that is on the level of a Stephen King novel. The screening was such a hit at San Diego Comic Con, that for one time only Fox decided to share the greatness with us. Speaking of greatness, Venture Bros creators Jackson Publick and Doc Hammer discussed and answered questions that fans submitted through the website adultswimpresents.com/NYCC. Their adult swim neighbors Seth Green and Matthew Senreich, creators of Robot Chicken, provided fans with a sneak peek of the newest season of Robot Chicken that aired the week after NYCC. Over at DC; Rocksteady, the creative team behind the hit Batman: Arkham Asylum gave fans a deeper look into their next installment Batman: Arkham City. Batman Arkham City was one of the many games that everyone in attendance was excited in seeing or getting a hands on demo. DC Entertainment, Warner Bros. Animation, Warner Home Video, and Warner Premiere gave everyone an early look at the upcoming Batman: Year One animated film which also includes the Catwoman animated short, as well as the Justice League: Doom animated movie. Panelist included the voice of Batman: Kevin Conroy, executive producer Bruce Timm, and voice director Andrea Romano giving fans insight into what’s to come from DC in 2012. At the DC Booth Arkham Asylum and Arkham City action figures were on display. With guys like Killer Croc, Robin, and Catwoman as well as all upcoming DC Direct Ame Comi figures, some based on the Darkest Night story arc. The Arkham City game was available for a hands-on demo. Both Batman Arkham City and Batman Year One were released that same month after NY Comic Con. On the Marvel side of things, at the Avengers stage, they held a Marvel Cosplay walk on. To start things off cosplayers YayaHan as Domino, Riddle as Wasp, and Marie-Claude Bourbonnais as Ms. Marvel took the stage for group and individual shots. All photos were of course taken by Marvel photographer Judith Stephens. The cosplays for the Marvel walk on ranged from popular cosplays to rare, meaning the character has been by almost everyone or the character or a certain version of a character is rarely done). When you look at the final group shot of all the cosplayers that participated in the walk on, it’s like looking at the X-Men family portrait. Just one big happy Marvel Family. Marvel has also entered the realm of anime with versions of X-Men, Blade, Wolverine, and Iron airing on G4TV. Head of Marvel Television Jeph Loeb presented an exclusive screening of X-Men and casting news for Blade. My second interview of the con was with Dave Gilbert of Wadjet Eye games, creator of the Blackwell series; A film noir game with a supernatural twist. In this interview we talked about the latest Blackwell game “Blackwell Deception” and the history behind the series. To end my night first I did a great X-Force shoot with cosplayers Jersey Ruskicho as Domino and my brother Nox Cosplay as Deadpool. We managed to find a nice stairwell spot that over looked the convention main entrance and just took it from there. Both looked amazing in the cosplays and were excellent to work with. My second stop for the night was the first official after party of NYCC at Tenth Rail over on 10th Ave. There is nothing like drinks, good music, and cosplayers to make a night very eventful. 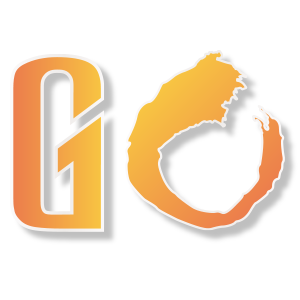 Hosted by S.O.S Gamers; the festivities included super hero themed drinks, video games, live music by DJ CR4SH and DJ GRAVEOFDEATH, a raffle and of course a cosplay contest. The place was packed, the people were fun, and the night was incredible. Saturday had to be one of the craziest days I've ever experienced at NY Comic Con. It was like an explosion of just everything happening at once. At one point I left to get a breather, plus I was kinda feeling ill so I needed the break. A sleepless night before didn't help things either. First thing in the morning Kadishu, Mei Hoshi & BalthierFlare came by with Rachel and Ger Tysk to do some body painting for their Scanty & Kneesocks cosplay that turned my bathroom into a crime scene, but I gotta say the outcome was impressive. The time during the actual painting was hilarious. Kadishu and I got on line for the Tekken producer, Katsuhiro Harada, singing. Kadishu had been working with Mei Hoshi all day and night on his Lars Alexandersson cosplay and today was the day he showed it off at NYCC for Harada who was doing a signing at the Namco booth. I tried to stay on line as long as I could but I had a pressing engagement that I dare not miss. That engagement was the large group of Spiderman Villains taking over the area across from the Avengers Booth. Villains such as: Hobgoblin, Kraven the Hunter, Rhino, Deadpool, Green Goblin, Carnage, Mysterio, Venom, Task Master, Doc Ock, and even Black Cat. The turn out by people was outstanding; the acting of the entire group destroying the Spiderman dummy was insane. Great performances by everyone involved, especially Carnage. If you ever want to see Carnage in real life, turn to one of the best costume makers in NJ, Larry Smith. Kadishu not only got an autograph, but got his picture taken by Harada for the impressive work of his cosplay. Panel wise it was packed every hour, of every minute. For all artist interested in getting into comic books, DC continued their talent search hosted by Editorial art director Mark Chiarello. The talent search starts with an orientation about how the search works, and what the various entities (DC Comics, MAD Magazine, and Vertigo) are looking for in an artist. In order to get your portfolio reviewed you must have attended the orientation. If you weren’t getting your portfolio reviewed, Bruce Timm premiered his latest project from Warner Bros. Animation for Cartoon Network; Green Lantern: The Animated Series. It’s a CG animated series that will include appearances by other Lanterns of the spectrum, such as the Red Lanterns. With the launch of DC’s new 52, all access panels, headed by Jim Lee, Geoff Johns, Shane Davis and others, let fans talk more in depth about what to expect and what directions they were going with titles such as Justice League and Superman. Marvel wise; in the wake of Fear Itself comes: Avengers: Shattered Heroes. Writers Matt Fraction (Fear Itself), Kieron Gillen (Journey into Mystery), and Christos Gage (Avengers Academy) answered the burning question of what’s to come along with a few surprises of their own. Marvel Television presented a panel exclusively showing a preview of the newest marvel animated series Ultimate Spiderman as well as their other animated and live action projects. In the world of video games Marvel is going all out appealing to all ages and levels of gaming. At the Marvel Video Game Panel, 2012 will be the year of Marvel for video games. With games like Superhero Squad (Online & Console), Ultimate Marvel vs. Capcom 3, X-Men Destiny MMO, and Spiderman: Edge of Time Marvel was looking to take 2012 by storm. Their biggest long awaited project that would definitely put Marvel on top in 2012 was "The Avengers" movie. This special presentation featured never-before-seen footage and appearances by special surprise guests: Kevin Feige, Chris Evans, Tom Hiddleston, Clark Gregg, and Cobie Smulders. In the Anime world, studios like Bandai and Sunrise held Q&A panels and premiered new trailers for their upcoming 2012 releases. Releases from Bandai included: Tekken: Blood Vengeance, Gundam Unicorn, and Gundam 00: The movie. Sunrise held its first official panel at NY Comic Con, and special guest included Executive producer of the hit series Tiger & Bunny. International digital Idol, Hatsune Miku made a NY Comic Con appearance with a panel held by Hatsune Miku creators Toshihiro Fukuoka and Masataka P. Discussing Hatsune’s musical talent besides singing pop, her videos, and premiere a new Miku Miku Dance animation. For those that have attended many a Cosplay Masquerade at NYCC or Sakura Matsuri Festival, the names Uncle Yo and Mario Bueno should be very familiar to you. Uncle Yo an anime Comedian and Cosplayer/Performer/Singer Mario Bueno held their first Power Hour together filled with laughs and of course music. Saturday was also the U.S. dubbed premiere of the anime Fairy Tail, with 3 full episodes. The U.S. voice actors and the creator of the series Hiro Mashima were present for fan questions. 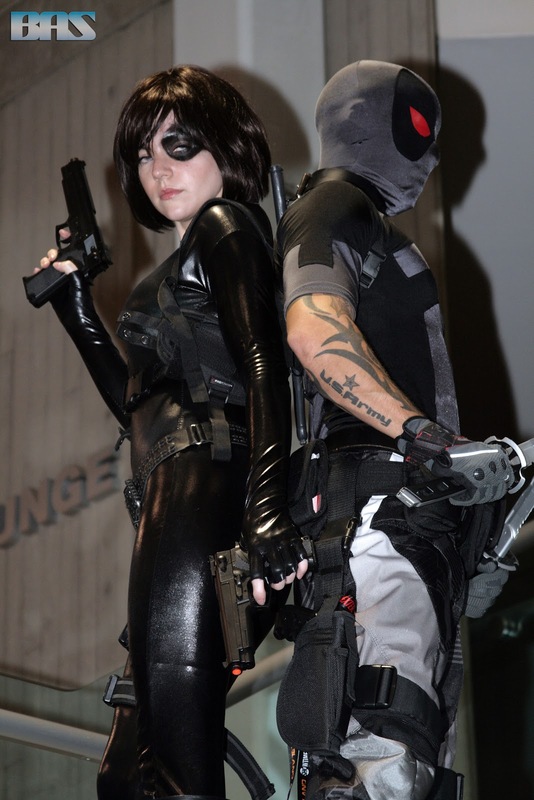 Capcom invited all cosplayers and fans to come dressed in any Resident Evil gear/cosplays to celebreate the 15th Anniversary of the Resident Evil Franchise at the MTV Theatre. Also the latest new about their newest addition to the Resident Evil franchise: Operation Racoon City, Revelations for the Nintendo DS, and the HD remakes of RE: 4 and RE: Code Veronica. My 3rd interview of the con was with the cast of Black Dynamite and Black Dynamite the Animated Series. This interview was more of a group setting on both ends; a group of reporters and some of the stars from the show. Stars included: Michael Jai White, Byron Minns, and Kim Whitley and Producers: Scott Jones Scott Sanders. This interview had to be the funniest interview I have ever done. The cast and crew were easy to talk and more than happy to talk to us and just have fun with it. Black Dynamite the animated series is something to look forward to in 2012. While Saturday did have its moments, it was the most draining of the entire con. I wanted to hit up the Cosplay Masquerade like I usually do every year, but this year I felt like I was about to collapse face first on the ground. The best part of the con for me was running into my friends that I’ve been trying to run into the entire con. Seeing them is what always makes a con more fun, and easy to deal with especially when you’re sick. Saturday marked everyone’s exhaustion point and we were all more than happy to just go home and sleep for days. The best thing about Sundays at a con is that there isn’t that much running around. It’s like the first day of a con, except that you are sore as hell. The best thing for me was that I was feeling somewhat better. Since the crowd was lighter this is when I did store browsing. I may have missed some items that were available before Sunday, but there were still some great items available. One booth not only sold, but took commissions for custom plushies. My brother Nelson (Nox cosplay) bought himself a nice custom Deadpool dragon. Over at the Mimoco booth, their selection of flash drives was ever impressive. Especially the Batman line of flash drives with each being able to hold anywhere between 2GB – 64GB, and play specific sounds for the character that you buy. Stylin Online had their big fortress of t-shirts, which is still impressive to this day. My big shoot of the day was with the same group of Spiderman Villains, but this time they cosplayed as all the different variations of Spiderman. One of the most unprecedented Spiderman variations was by Billyman, who cosplayed as Spiderman Ham, a Spiderman cosplay which you do not see all too often or at all. This time the group was more fun and laughs, especially since its Spiderman and plus Sunday was kid’s day. Since it was kid’s day a lot of panels were more kids oriented as well as a separate costume contest for kids 12 and under. For the kid that’s a Harry Potter fan, they could have started the day with some Wand dueling techniques from the Harry Potter NYC group; learning both offensive and defensive positions that have been used in the Harry Potter documentary films. Practice wands were available if your child didn’t have their own wand. Now every kids knows the answer to the age old question “What time is it? !…“Adventure Time!” And of course the ever famous “Yeaaauhhhhhh!” from Regular Show. Kids and fans alike got to join creators and voice actors as they talked about how these shows came about and what’s to come. Parents wanting their kids to learn something more than just catch phrases The Magic School Bus and teacher Ms. Frizzle were at the Hasbro stage doing a read along from their newest book “The Magic School Bus and the Climate Challenge” for all the kids in attendance. The Magic School Bus celebrated its 25th Anniversary in October and with that comes a new game for the Nintendo DS “The Magic School Bus: Oceans”. Hasbro was also happy give fans a inside look into the hit series “Transformers Prime” which airs on the HUB TV Network. Parents growing up watching cartoons are all too familiar with Looney Tunes. These parents will be more than happy to hear that classic cartoons such as Looney Tunes and various other Hanna-Barbera and Warner Bros cartoons have now come to Blu-Ray. At a special panel Animation Historians and cartoon experts discussed and presented side by side comparison footage. For comic fans book and anime fans that were looking for something other than comics and anime, Sunday proved to be a good day for that. For those that never had a reason to go check out a Broadway show, Spiderman: Turn off the Dark held a panel with writers Roberto Aguire-Sacasa and 2-Time Emmy award winner Glen Berger. With music by Bono and The Edge of U2, Spiderman: Turn off the Dark promises to excite fans with remarkable sets, costumes and effects to bring the story or Spiderman to life on the Broadway stage. The people at the Japan Society held 4 individual 25 min classes within a 2hr block. So for anyone that has wanted to learn some Japanese this was the panel to attend. Of course full courses are available at the Japan Society. You could have signed up that day at the con or for those that missed it check their website or pay them a visit at their HQ in Manhattan. For non comic TV, IFC recently has been airing its own original programming. Their 2 big hit comedies, Portlandia and The Increasingly Poor Decisions of Todd Margaret, made their NYCC debut. Holding 2 separate panels within their own panel you were able to sneak a peek and Q&A with the star of “The Increasingly Poor Decisions of Todd Margaret” David Cross and then do the same with the stars of “Portlandia” Fred Armisen and Carrie Brownstien. My fourth and final interview was with the creator of the Mass Effect Universe Mac Walters, the lead writer for Mass Effect since day one and up to the very end of Commander Shepard’s story which comes to a close March 6th of 2012. Being able to interview Mac Walters was the entire highlight of my time at NYCC. Mass Effect is just an incredible story, with some of the most amazing characters and art work in a game. While I am a huge Batman fan, I’ll always be a bigger Mass Effect fanatic than anything. For this interview I finally had my official cosplay correspondent Mei Hoshi who never really got to experience the madness of all 4 days of NYCC. Mainly because she was incredibly busy working hard on her cosplays during 21/2 days of the con and because her Kneesocks cosplay along with her friend BalthierFlare cosplaying Garterbelt attracted such a crowd that they could barely move around the con. So Sunday cosplaying as Alisa Bosconovitch from Tekken she conducted her first interview with Mac Walters. After the Interview Mei and I walked around as much as we could considering there was only an hour left, so we made our way to the Anime Festival part of the con. Things were winding down there as well, but the Anime crowd still made their presence known in support of a now smaller venue for the Festival itself. Running into friends was a lot easier this time around mainly because the friends we were looking for were more Anime than comic books so we knew exactly where to look. When the con was finally closing down it made for a good opportunity to take some last minute shots of my friend’s cosplays right before NY Comic Con came to a close. A special shout out to photography colleagues; Andrew Baka, Knightmare6, Negative Pop, and writer Master Gio for either helping me out or presenting me with photo opportunities during the con. Four days of New York Comic Con will get some getting used. It was a very exciting 4 days, and there was not one time where I said I’m bored. I doubt anyone could say that, unless you were stuck at a table. For the most part there was always something to see, plenty of panels going on every minute of every day, and opportunities to play a part in making this year’s NYCC a big hit. Everyone can say that it’s still not San Diego and they’re right. It’s NY Comic Con plain and simple. The biggest Convention in one of the biggest cities on the East Coast. There is no sense in trying to compare the 2; it’s more about being able to call this con ours. When people come to NY Comic Con they know that they are getting a great NY con experience. And the best part is that you get to experience the city of NY during your entire stay. So regardless of the time you just walk the streets of Manhattan and just take it all in. I just hope that next time I’ll have the benefit of being at full health and can enjoy it more.